Escape the Snow this Winter! The Golf Performance Center at Old Corkscrew GC in Fort Myers, Florida is the Winter Golf Academy for PGA of Canada Professional Dave Smallwood. In his 6th winter, Smallwood the 2012 Ontario PGA Teaching Professional of the Year, will be offering Canadian golfers weekly golf schools and various individual lesson programs for the 2017 winter season. Instruction offerings can accommodate single students as well as groups of two or more. Dave provides extensive swing, short game and on course instruction at the award winning Old Corkscrew GC. This Jack Nicklaus signature course and practice facility along with the spectacular Southwest Florida weather will create the wow factor to make your experience knowledgable, memorable, and a special time in the sunshine. Welcome GiftGOLF PERFORMANCE CENTER AT OLD CORKSCREW JUNIOR PERFORMANCE CAMPS 2017The Golf Performance Center at Old Corkscrew GC will be the home of the 2-winter season Junior Performance Camps. These camps will provide extensive swing, short game and on course instruction from veteran PGA of Canada Professional Dave Smallwood. The golf camp provides 5 night accommodations, breakfast each day, shuttle service, 5 rounds of golf, 10 hours of on range instruction, 20 hours of on course instruction as well as daily 1 hour instruction debriefing. The juniors will also have sessions on fitness, nutrition and golf scholarship information. Juniors will enjoy the area and everything it has to offer. In the past juniors, have enjoyed a Florida Everblade Hockey game, time at the beach, dolphins and some great ball hockey and volley ball games. The award winning Old Corkscrew GC will act as the home club and instruction facility for The Golf Performance Center at Old Corkscrew. The student will be staying in the condos at the Smallwood’s gated community of Bella Terra in Estero, Florida. The community is equipped with pools, fitness center, tennis, volleyball, basketball and even roller hockey. It will be home base and will be of the highest standard to accommodate the participants. The award-winning golf course is a Jack Nicklaus signature design and boasts an upscale practice facility. The facilities are fast becoming renowned in southwest Florida for its challenging golf course and outstanding hospitality. The club and practice facility has the most hospitable staff; management and ownership that will make all participants feel very welcome. It is with great pride that Dave Smallwood, Director of Instruction at the Golf Performance Center at Whistle Bear GC, announces the 2015/2016 Whistle Bear Junior Performance Team. The team program is moving into the tenth year of developing some of the finest junior golfers in the Ontario and Canada. The team keeps stamping out elite junior golfers, tournament champions, award winners, scholarship recipients and fine young men and women. To date we have placed over 22 juniors on USA Scholarships and have developed numerous players who have moved on to play golf at Canadian Universities and Colleges. MISSION STATEMENT The goal of the Whistle Bear Junior Performance team is to identify and target talented athletic junior golfers and provide them with all the necessary tools to advance their golf careers to the highest level possible. Team members will be exposed to the best in coaching, golf facility, practice facility, mental training, fitness, equipment testing, competition scheduling and on course training in a fun team atmosphere. PEYTON COSTABILE, KATE JOHNSTON, LAUREN DOBBIE, MADELEINE GEHAN, RIA RAHATE, TATIANA TAIT, JOY LIU, CIARA CONSTABILE, REESE VANMACKELBERG, ABBY WHITE, LOGAN HACKETT, KAYDEN WHITE, RYAN COOK, HUNTER BAIRD, JACK FRAZER, ZACHARY BURT, AIDEN SHAH, NOAH GUTA, CARTER ROUNG, EVAN ROTH, BEN GUTA, GABE YAZANI, LIAM MCCAULEY, BEN BAUER, ZACHARY HART, OWEN LIPSKIE, DILAN ONEAIL, CHANDLER ROMEO ,AIDAN BRADY, ANDREAS DIOGENOUS, HOLDEN RYDER, CARTER SNOWDEN, LUKE COWEN, DYLAN HENDERSON, NATHAN WIERSMA, BENNETT RUBY, ZACH FRIESEN, NOAH ROMEO, DAVEY MORTON, LUKE STEENGE, SEAN TIPPIN, ALEX TURCHAN, XAVIER AYORA, JONATHON KERR, YUSUF SUSIWALA, NICHOLAS ZORZI, ISIAH KATSUBE, ERIC SHEA, MATTHEW ORTLIEB. Sunday June 14 at 8pm starts the new series Golf Performance with Dave Smallwood. Dave talks with professional and amateur golfers sharin techniques, fitness advice, and stories about the game of Golf. Rogers Cable TV 20. 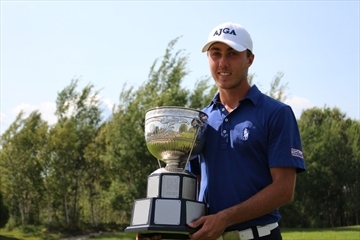 Waterloo’s Matt LeMay captured the Ontario junior boys golf championship in Sudbury on Friday. SUDBURY — His Twitter name says it all . . . Lemayzing. Waterloo’s Matt LeMay fired a 5-under 67 on Friday to overcome a three-shot deficit and capture the Golf Association of Ontario junior boys championship at the Timberwolf Golf Club. LeMay finished the 72-hole tournament at 2-under 286, the only player to finish better than par. His closing 18 holes – the best round of the tournament – featured three birdies, 14 pars and an eagle on the par-5 11th hole as he finished four shots ahead of Cayuga’s Charles Corner, who closed with a 74. Waterloo’s Tyler Douse closed with a 77 to finish in a tie for 14th place, 14 shots behind LeMay. A Whistle Bear member, LeMay credited his coach Dave Smallwood for giving him a pep talk at the start of the event that stuck with him through four grueling rounds at the extremely difficult layout. The soon-to-be Georgian College student won’t have long to savour his victory as he’ll be in Quebec on Monday in hopes of qualifying for the RBC Canadian Open that opens Thursday at the Royal Montreal Golf Club. LeMay earned his spot in the qualifier at a recent regional event at his home course. If he doesn’t qualify for the Open, he will head to Ohio for an American Junior Golf Association. From there, he’ll play the Canadian junior golf championship in Niagara Falls and back-to-back AJGA events in Michigan. LeMay’s victory marked the third straight week that Waterloo Region golfers have come up big. Whistle Bear’s Trevor Ranton captured the Ontario junior boys match play championship two weeks ago in Gravenhurst and Westmount’s Chris Hemmerich won the Ontario men’s amateur championship last week in Georgetown. Garrett Rank is quite aware of the fact that in life there are many things beyond one’s control. And after meeting him for the first time recently, I soon realized that the ability of this multi-talented 26 year-old from Elmira to both fully understand and accept that fact goes a long way to explaining his current success. That success centres around two very different sporting endeavours: playing golf and refereeing hockey. Rank is currently operating at an elite level for each one. Rank’s golf resume is extensive and includes winning the prestigious Toronto Star Amateur in 2011, leading the Waterloo Warriors golf team to a national championship in 2012 and medaling at the USGA Public Links Championship in 2013. He’s been a member of Team Canada for three years and maybe most impressive, was runner-up at the 2012 USGA Mid-Amateur. Winning that event would have earned Rank an invitation to Augusta and the Masters tournament, every golfer’s dream. Unfortunately he was edged out by Nathan Smith of Pittsburgh, the event’s only four-time champion. As a hockey official, Rank’s career path isn’t any less impressive. In addition to refereeing in the OHL and OHA this year, Rank was selected to headman the gold-medal game at the World Under-17 Hockey Challenge in Nova Scotia in early January. More recently, he received a professional visa from the NHL to work some games in the American Hockey League this month and possibly next. It’s obvious that Rank is equally passionate about each pursuit so I asked him what he thinks the two have in common. When it comes to maintaining composure under emotionally challenging circumstances, Rank has certainly had his share of real-life experience. While refereeing in January 2011, Rank experienced some inexplicable pain and fortunately wasted no time getting to a doctor. He soon found out that he had testicular cancer. He underwent surgery and his health nowadays is just fine but the ordeal brought him some new-found perspective. Rank’s world was unexpectedly shaken again this January when his father Richard, a beloved fixture in the Elmira community, passed away suddenly while Garrett was refereeing at the World U17 tournament out east. “My father passed away the day before the gold-medal game. There was some brief discussion with my family about whether to do the game or not but ultimately, I knew deep down that it’s what he would have wanted me to do. In addition to his father, Rank feels fortunate to have had a number of significant mentors in his life including Lance Roberts as a hockey official and Dave Hollinger who, along with the late Jack Pearse, coached Garrett at UW. Hollinger doesn’t seem the least bit surprised that Rank has been able to excel in both fields. Dave Smallwood, Director of Instruction at Whistle Bear’s Golf Performance Center in Cambridge, is Rank’s current coach and sees (pardon the pun) nothing but wide-open fairway in his future. Whether it’s the PGA, the NHL or the TSX for that matter, Garrett Rank knows all too well that the road ahead will always have some unexpected twists and turns. But just as his father would have wanted, he’ll keep calm and carry on. 2014 Whistle Bear Junior Performance Team Gears up for the season! 2014 Whistle Bear Junior Performance Team will begin team practices with Coaches Dave Smallwood, Mike Skimson, Mike Martz and Mark Wilson for the season this weekend after a Team meeting tonight in which the 57 juniors received their team golf bags. Alex Carrigan is continuing to work hard on his game with Dave Smallwood, Director of Instruction at Old Corkscrew Golf Course in Estero, Florida for the winter months. Need to get away from the cold weather. Now is the perfect time to book your trip to South West Florida and visit Dave Smallwood in Estero, Florida for a week long golf school. Only two weeks are left available so don’t delay and be disappointed. Visit www.golfperformancecenter.ca/about/winter-golf-schools for full details on dates and what is included in the week of instruction with 2012 PGA of Ontario Teacher of the Year, Dave Smallwood. The Golf Performance Center at Whistle Bear is to provide a series of weeklong golf schools in Ft Myers, Florida. Groups of Canadian golfers travel to Old Corkscrew GC during the winter months. These week long camps can accommodate groups of two or more and will provide extensive swing, short game and on course instruction from Whistle Bear Director of Instruction and PGA of Canada Professional Dave Smallwood. The golf school provides 6 nights’ accommodations, breakfast each day, shuttle service, 5 rounds of golf, 10 hours of on range instruction, 20 hours of on course instruction, personal DVD of videos and instruction covered, as well as daily instruction debriefing. The award winning Old Corkscrew GC will act as the home club and instruction facility for The Performance Golf schools. The student will be housed at the new Hilton Garden Inn or Homewood Suites in Ft Myers Florida. These luxury facilities will be home base and will be of the highest standard to accommodate the participants. The award winning golf course is a Jack Nicklaus signature design and boasts an upscale practice facility. The facilities are fast becoming renowned in southwest Florida for its challenging golf course and outstanding hospitality. The club and practice facility has the most hospitable staff; management and ownership that will make all participants feel very welcome. Dave is also available for individual lessons for Canadians visiting the Naples, Fort Myers area during the winter season. Don’t just play golf this winter in the sunny south improve your game. Dave Smallwood, Director of Instruction and Head Coach of the Whistle Bear Junior Performance Team is proud to announce the 2014 team members. The team is coming off of a spectacular year seeing a record 8 players graduate and move on to US golf scholarships. Whistle Bear juniors would also have a record 40 players qualify for Provincial or National Championships. The year would see our first International Championship with Trevor Ranton bringing home the East Aurora Junior Masters trophy. Andrew Cox would return from the Maple Leaf Junior Tour Canadian Championships in Orlando, Florida with the trophy for low junior boy as well as new team member Madison Easterbrook would top a strong field of girls to capture the girls championship. Ranton and Coach Smallwood would represent Canada at the Srixon International Championship in Australia as well as Mackenzie Raines being selected to compete for Ontario at the Ontario/Quebec Team Matches. The year would culminate with Whistle Bear and the GPC being awarded the GAO Regional Junior Team and would see team coaches Mike Martz and Angella Lee to oversee and coach the program. Mike Martz would continue the Ontario PGA awards for Whistle Bear by being named the Ontario PGA Junior Leader of the Year. If that wasn’t enough the team would have 4 juniors selected for the Golf Association of Ontario High Performance Programs with Haley Barclay, Taylor Kehoe and Mackenzie Raines being named to the GAO Regional Junior Team and Trevor Ranton being selected to the GAO High Performance Junior Team. Juniors will be placed into the appropriate mini team that best serves their level of play and experience. Each team will have Dave Smallwood as the teams head coach and each team will be assigned a team coach. The FUTURE LINKS programs will be coached by Theresa McDermott, the GIRLS NEW COMPETITOR TEAM, DEVELOPING COMPETITOR TEAM, ADVANCED COMPETITOR TEAM coach will be Carrie Vaughan, BOYS NEW COMPETITOR TEAM coach will be Mike Martz, BOYS DEVELOPING COMPETITOR TEAM will be coached by Mark Wilson, the BOYS ADVANCED COMPETITOR TEAM will work with Mike Skimson and the BOYS ELITE COMPETITOR TEAM will be under the watchful eye of Coach Dave Smallwood. The Future Links program will be conducted under the guidelines set out in the Golf Canada initiative. The Golf Performance Center’s Saturday morning beginner girls program will be joined by our Active Start and Learn to Play programs under the Future Links umbrella. These programs will be designed to target and develop players to join the Whistle Bear Junior Performance Team. Junior golf membership privileges at Whistle Bear GC. Practice range privileges at the Golf Performance Center @ Whistle Bear. Opportunity to work with team Sport Psychologist Dr. Rich Ennis. Equipment assessment and club fitting with Certified Fitting Technician Greg Bullock. Access to state the art JVC video system, Flightscope Launch Monitor and TOMI Putt Lab and Ping putter testing and fitting. Tournament and scheduling consultation, with fundraising opportunities for tournament funding.